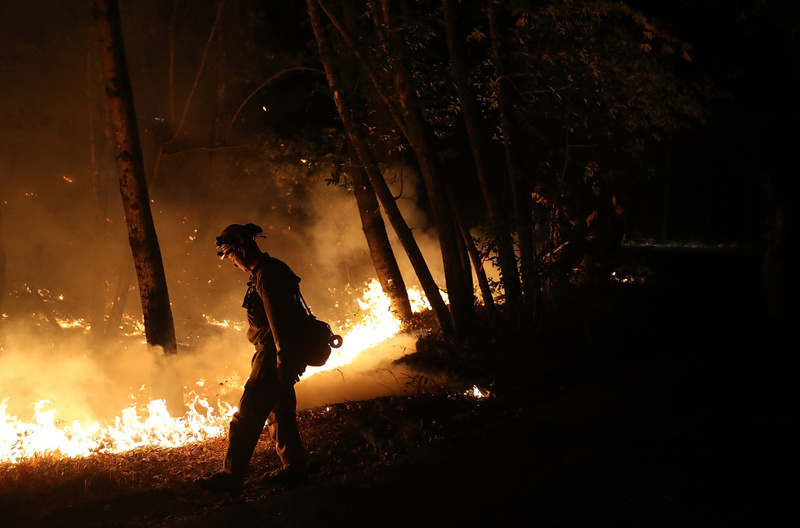 CalFire firefighter Brandon Tolp uses a drip torch during a firing operation while battling the Tubbs Fire on October 12, 2017 near Calistoga, California. Gov. Jerry Brown signed an executive order on Thursday that aims to reduce the dangers of wildfires following some of the deadliest and most destructive blazes in state history. The order calls for accelerating forest management procedures such as cutting back dense stands of trees and setting controlled fires to burn out thick brush. Brown wants to double the forest area managed by such practices to 500,000 acres within five years. Brown's order also calls for streamlining the process of allowing private landowners to thin trees and encouraging the building industry to use more innovative wood products. 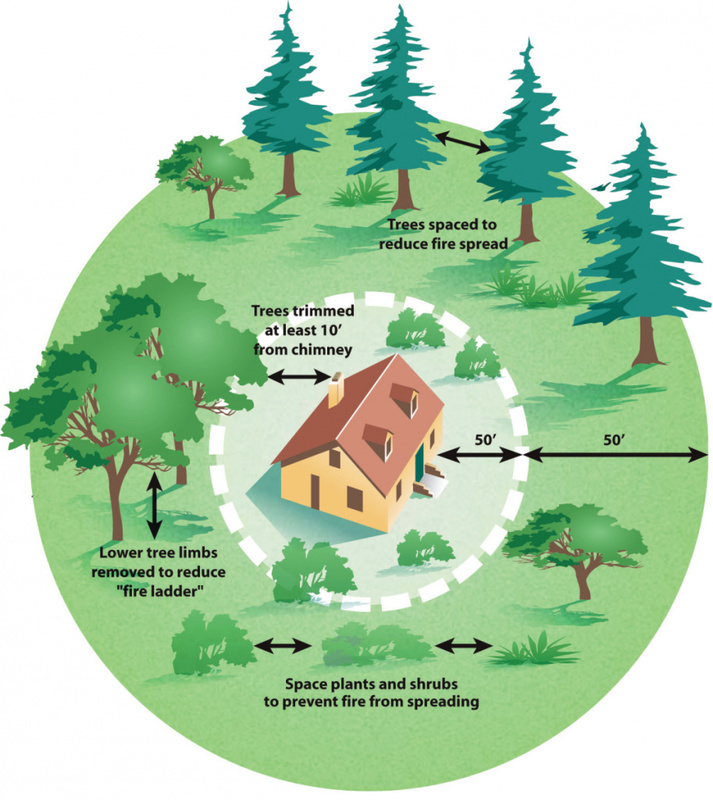 A graphic showing how to maintain defensible space around a home to reduce the threat of wildfire. His office said a Forest Management Task Force will be convened in coming weeks to help implement the order. The governor's May budget revision, due for release on Friday, includes $96 million to support his order. That's in addition to $160 million Brown already proposed for fire protection and forest work in the upcoming fiscal year. California has about 33 million acres of forests, ranging from federal lands to private holdings. Brown says healthy forests are carbon sinks, with trees and shrubs absorbing carbon and thus reducing the amount in the atmosphere that contributes to global warming. However, forest fires release that carbon during burning. 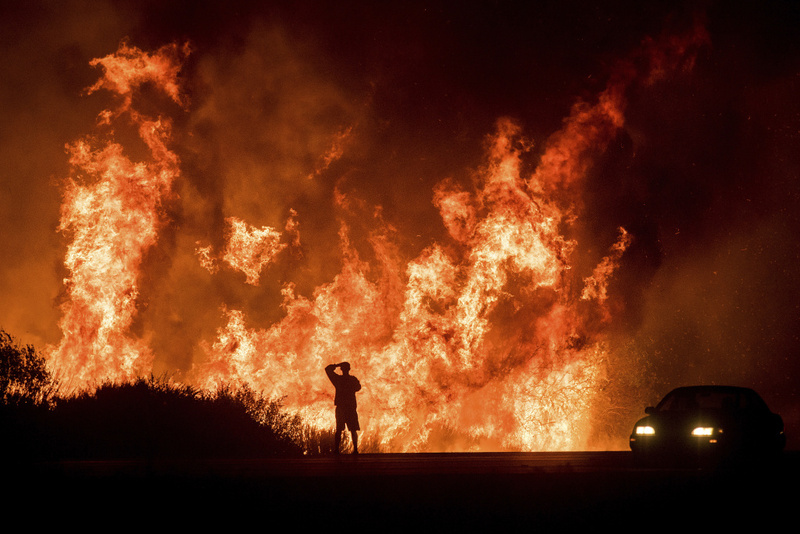 Eight of California's most destructive fires have occurred in the past four years. They include the Thomas Fire last December — the largest California wildfire on record — that burned 282,000 acres in Ventura and Santa Barbara counties and a complex of Northern California fires last October that killed more than 40 people and destroyed thousands of homes. Eight of California's most destructive fires have occurred in the past four years, including the Thomas Fire last December — the largest state wildfire on record. In addition, drought, insects and disease have killed some 129 million trees since 2010, most of them in the Sierra Nevada. The governor's order aims to implement the California Forest Carbon Plan, also released Thursday. The 186-page report, prepared by a team of federal, state and local organizations, proposes a number of measures for restoring and keeping forests healthy. 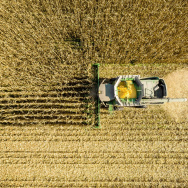 They include encouraging use of wood for biomass — that is, burning it to create electricity. 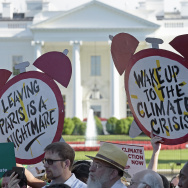 Kathryn Phillips, director of Sierra Club California, said part of the plan is worrisome. "The people who make money by burning trees...those folks have an oversized influence in this administration," she said. Phillips applauded calls in Brown's order and the forest plan to research and fund forest management but also had concerns about how the order will be implemented and whether it might loosen restrictions on timber harvesting in forests. "It's very vague," she said of the order. "This is a governor who has not liked environmental review."